Teachers and students cut and paste text from OER sites all the time—usually that’s where the story ends. The OER site doesn’t know what text was cut, nor how it might be used. Enter CaPRéT: Cut and Paste Reuse Tracking. OER sites that are CaPRéT-enabled can now better understand how their content is being used. The user gets the text as originally cut, and if their application supports the pasted text will also automatically include attribution and licensing information. The code and other resources can be found on their site. You can also read Phil Barker’s (JISC CETIS) experience testing CaPReT and feedback and comments about the project on the OER-DISCUSS list. One of the great things about CaPReT is the activity data is available for anyone to download (or as summaries Who’s using CaPRéT right now? | CaPRéT use in the last hour, day and week | CaPRéT use by day). Both these examples rely on the same refined data source rendered in different ways and in this post I’ll tell you how it was done. As always it would be useful to get you feedback as to whether these visualisations are useful, things you’d improve or other ways you might use the recipes. I should also say that there was some post production work done on the map. For some reason some of the ‘great circles’ weren’t so great and wrapped around the map a couple of times. Fortunately these anomalies can easily be removed using Inkscape (and while I was there added a drop shadow. Using the Basic Example, Google v3 (because it allows custom styling of Google Maps) and Google Spreadsheet Example I was able to format the refined data already uploaded to a Google Spreadsheet and then plug it in as a data source for the visualisation (I did have a problem with reading data from a sheet other than the first one, which I’ve logged as an issue including a possible fix). A couple of extras I wanted to do with this example is also show and allow the user to filter based on source. There’s also an issue of scalability. 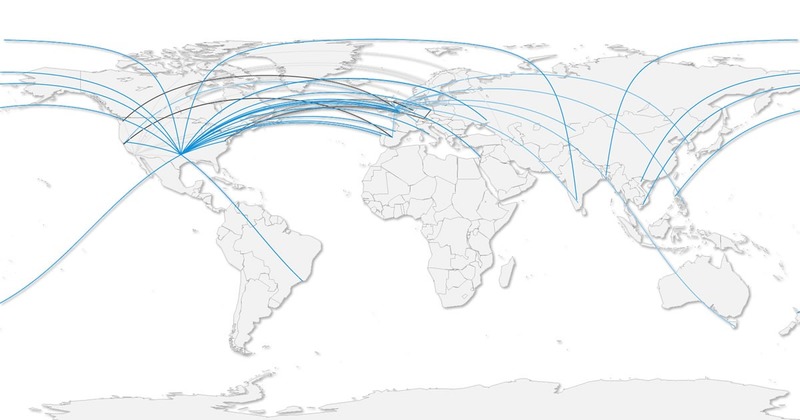 Right now the map is rendering 113 entries, if CaPReT were to take off the spreadsheet would suddenly fill up and the visualisation will probably grind to a halt. So there you go, two recipes for converting IP data into something else. I can already see myself using both methods in other aspects of the OER Visualisation and other project. And all of this was possible because CaPReT had some open data. 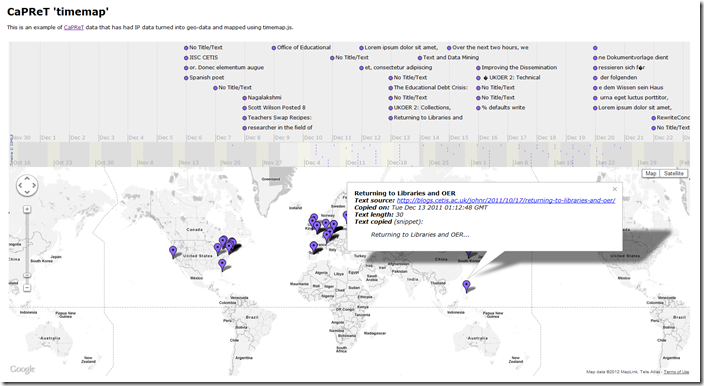 I should also say JISC CETIS have a wiki on Tracking OERs: Technical Approaches to Usage Monitoring for UKOER and Tony also recently posted Licensing and Tracking Online Content – News and OERs.